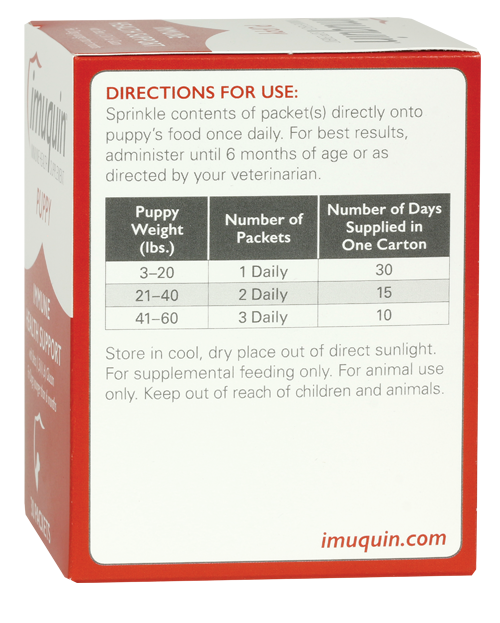 Imuquin™ Puppy is a unique blend of ingredients that functions to support the immune health of puppies during their first six months. These ingredients include beta-glucan, marine lipids, and a mix of vitamins and minerals. Imuquin™ Puppy is available from your veterinarian. Extracted from the cell wall of brewer’s yeast. Maintains innate defenses and cell- and antibody-mediated response. 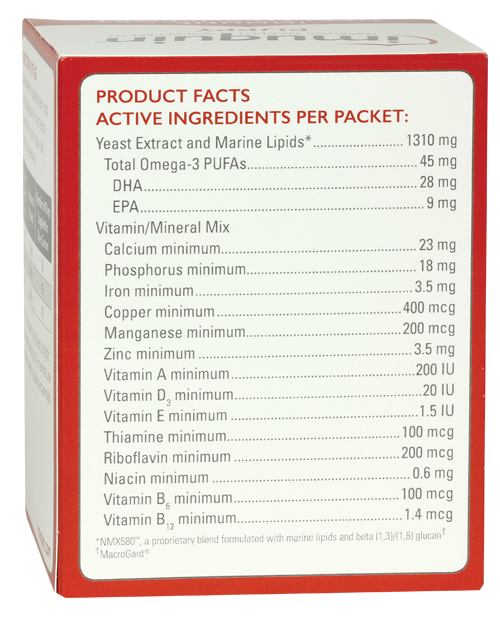 Source of omega-3 fatty acids, including EPA and DHA. DHA is important for normal development of the eyes and nervous system. Help maintain organ and tissue functions, including immune function. Adequate intakes of vitamins and minerals are required for the immune system to function efficiently. Maintain the structural integrity of immune cells. Sprinkle contents of packet(s) directly onto puppy’s food once daily. For best results, administer until 6 months of age or as directed by your veterinarian. WHY IS IMMUNE HEALTH SUPPORT IMPORTANT FOR PUPPIES? A well-functioning immune system is crucial to puppies for staying healthy. Puppyhood is an exceptionally stressful time in a dog’s life, during which time the immune system is subject to many challenges. 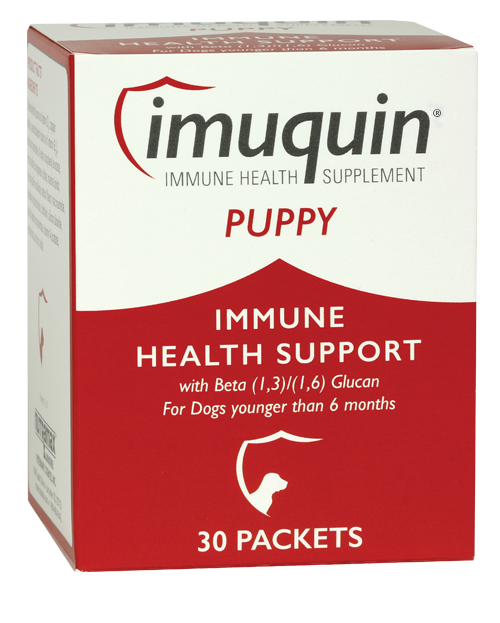 HOW DOES IMUQUIN™ PUPPY PROVIDE IMMUNE SYSTEM SUPPORT? 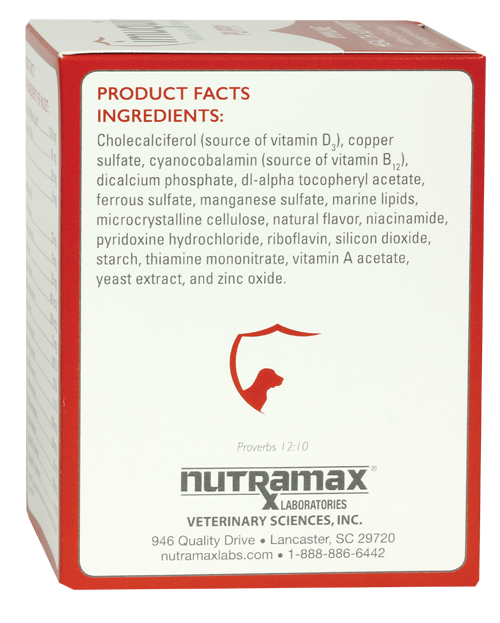 The blend of ingredients in Imuquin™ Puppy is specially formulated to provide immune support. Beta-glucan helps maintain a normal immune system, preparing it for possible challenges. Omega-3 fatty acids help support normal development of vision and the nervous system. Several vitamins and minerals help the immune system function effectively. HOW WOULD I KNOW THAT AN IMMUNE SUPPORT PRODUCT IS EFFECTIVE? Effectiveness of an immune support product is largely measured by normal growth and continued good health. This is the principle of preventive health care. WOULD MY PUPPY BENEFIT FROM IMMUNE HEALTH SUPPORT? During the formative first six months there are numerous opportunities for the immune system to function suboptimally. Sometimes puppies need help to manage the challenges of puppyhood. We would encourage you to ask your veterinarian, who will discuss specific concerns and immune system issues and make appropriate recommendations for your puppy and your individual situation.